If you're like many parents, you probably wish you could save more toward your child's college education. But after paying for housing, food, transportation, and other expenses, putting extra money away for college can be challenging. However, if your son or daughter will be entering full-time preschool or kindergarten soon, you might have more money available than you thought. Your child care costs have probably been dropping as your child has grown, but on average, New York parents are still paying about $12,000 a year for a four-year-old in a center-based child care facility. Although you may continue to have some costs if your school district doesn't offer full-day preschool/kindergarten or if your child will need before or after school care, you should see some savings once your child enters elementary school. There are plenty of places you could direct that "found" money; however, you might want to consider contributing some of it to your child's 529 plan account. Let's say you no longer need any child care, which means you'd be saving about $12,000 a year. If you take 50% of that and put it in your 529 plan account, you'd be able to contribute about $500 a month. Wondering how that amount will compare with the total cost of higher education? You can estimate future college costs for a specific school or type of school by using Vanguard's college cost projector. For example, the current annual cost for one year of a four-year public college (including room and board) is $18,900. The estimated cost of that same year of public college 13 years from now is $40,312, or $176,351 for four years. * So your additional savings could pay for about 64% of your child's total college costs. This hypothetical example assumes an annual 6% return, and a monthly contribution of $500 for 13 years. This example doesn't represent any particular investment, or taxes, if any, payable upon withdrawal, nor does it account for inflation. Don't be discouraged if you're not able to save anywhere near 100% of your child's college costs. You're far from alone. In 2014, parents hoped to cover 38% of the cost of college through a combination of income, savings, and borrowing, according to Sallie Mae. And don't forget that your child might be eligible for financial aid—and that he or she may be able to cover some of the costs. According to Sallie Mae, 56% of students in 2014 reported paying some of their college costs with income and savings. 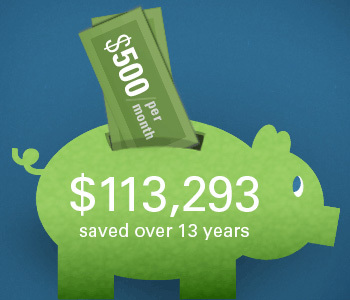 To work out your personal savings goal, you can use Vanguard's college savings planner. Although college may seem far away, putting a plan in place now for how to cover those future costs will make it easier for you to reach your goals. Sources: Child Care Aware of America, "Child Care in America: 2014 State Fact Sheets"; Sallie Mae, "How America Pays for College 2014." *An annual college-cost inflation rate of 6% is assumed.